SELLERSBURG — Silver Creek lived up to the hype — and then some — Tuesday night. 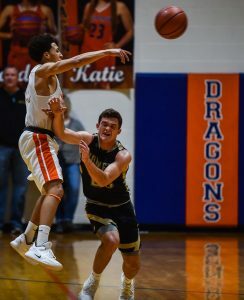 The Dragons, who garnered of plenty of buzz in the preseason, opened their 2018-19 campaign with an impressive 82-39 victory over visiting Henryville. Sophomore forwards Kooper Jacobi and Trey Kaufman combined for 35 points (Jacobi, 18, Kaufman 17), 22 rebounds (Kaufman 15, Jacobi seven) and seven assists (Kaufman four, Jacobi three) while senior guard Zane Gross tallied 17 points for Silver Creek, which was ranked No. 11 in the Associated Press preseason Class 3A poll. 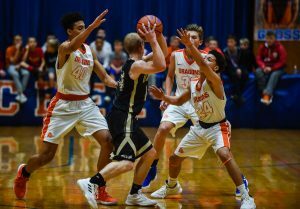 Silver Creek shot 67.4 percent (31 for 46) from the field, including 82.8 percent (24 for 29) from 2-point range, dished out 23 assists and forced countless turnovers as the Dragons picked up where they left off last season, when they went 20-6 and won their fourth sectional title in five seasons before losing in the regional final. Buoyed by their suffocating full-court press, the Dragons ran out to a 14-2 lead and never looked back. “I was pleased with the way we played,” said Silver Creek coach Brandon Hoffman, whose team held the Hornets without a field goal for the first 5 minutes, 24 seconds. “I thought we were very unselfish and we executed. We showed that we had the focus to kind of come out and do what we wanted to do, kind of force the tempo and move the ball around and get up the court a little faster than we have in the past. The Dragons led 22-7 at the first stop, then scored the first nine points of the second quarter — on a 3-pointer by Holden Groher, back-to-back baskets by Gross and a putback by the 6-foot-8 Kaufman. Silver Creek led 42-14 at halftime. The Dragons added to their lead in the third quarter, but not much thanks to Henryville’s Kade Badger. The 5-9 senior guard nearly single-handedly matched Silver Creek point-for-point in the period (Dragons 20, Badger 17). He tallied 10 points in the first 2:37 of the second half, hitting one free throw and a trio of 3-pointers — the last of which he banked in, which drew a smile from both Badger and Gross, who contested the shot. In fact, from late in the first quarter until early in the fourth quarter, Badger tallied 26 consecutive Hornets points — on his way to a game-high 29. Senior guard Ty Kessinger, who was serenaded with a rendition of “Happy birthday” by the Silver Creek student section as the fourth quarter began, added seven points and a game-high five assists for the Dragons. Although, the win may only add to the hype surrounding his team. The Dragons play at Mid-Southern Conference rival Charlestown next Tuesday. Henryville (0-1): Kade Badger 29, Trenton Guthrie 3, Westin Allen 2, Logan Owens 1, Cole Pirrman 2, Parker Rappe 2. Silver Creek (1-0): Zane Gross 17, Ty Kessinger 7, Kooper Jacobi 18, Trey Kaufman 17, Jack Hawkins 6, Josh Landers 3, Jackson Jacobi 3, Brandon Northern 3, Holden Groher 6, Andrew Baxter 2. 3-point field goals: Henryville 3 (Badger 3); Silver Creek 7 (Groher 2, Gross, Hawkins, J. Jacobi, Northern).